The Christmas countdown has commenced and, for most folks, that means rushing out to malls and department stores, crossing items off their loved ones’ wish lists. For me, holiday anxiety comes from countless hours scouring my cookbooks, handwritten recipe collections, magazines and the internet, in search of the perfect cookie and candy recipes to wow family, friends and neighbors. I have my staples: traditional chocolate chip, the always-a-hit Snickerdoodles, and my mom’s Chocolate Crinkles (which, just like her meatloaf recipe, I will never divulge).The old standbys never disappoint, but I do enjoy throwing in one or two new surprises to keep my recipients on their toes and always looking forward to the holidays. This year, the internet has provided me with my latest addition to my rotation of seasonal sweets. It’s an unexpected twist using a classic cookie as the main ingredient and is both easy and inexpensive to make. The result is an overwhelmingly delicious hybrid of a cookie and candy – Oreo truffles. Gently melt chocolate over a double boiler until smooth. Set aside and allow to come to room temperature. In a food processor, pulse Oreos until they are close to the consistency of pebbles. Reserve approximately 2 Tablespoons, for topping. Add chocolate syrup to the food processor and continue to pulse until the mixture comes together to form a dough. 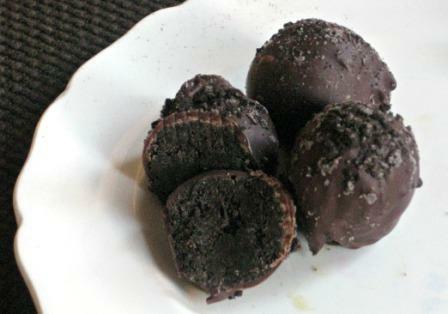 Roll Oreo mixture into 1” balls and place on cookie sheet lined with wax paper. Refrigerate for approximately 15 minutes. Once slightly chilled, remove from refrigerator and dip balls, individually, in chocolate until complete covered. Using two forks, gently remove truffles from the chocolate, tapping off the excess chocolate back into the bowl. Place on cookie and sprinkle with reserved Oreo crumbs. Put sheet back in the refrigerator until chocolate coating has set. Oreos are perfect all on their own; slightly dry and wafer like, the vanilla filling and chocolate cookie combination is timeless. Their gritty texture is still apparent, even pulsated down into sand-like grains. Not only does the chocolate syrup act as the binder to create a dough-like consistency, it makes the chocolate-y flavor incredibly strong. The chocolate coating will set in the fridge in a matter of hours and provides the perfect candy coating. A quick sprinkle of crushed Oreos makes these treats appear professional. No one would believe you if you told them the truffles were produces with three ingredients. With only a few weeks left until the big day, some shopping to do, and a Christmas Eve party to plan, I’ve got quite a few things to take care of. A recipe like this, though, makes things easy; it takes no time at all for me to whip these up and the people on the receiving end think their bakery-level material. The only issue is refraining from “taste testing”. If I’m not careful, I may have none leftover to help spread the holiday spirit.